Now that your child is mobile: crawling, walking and running… they are into everything! Would you know what to do in the event of an emergency? Be prepared! 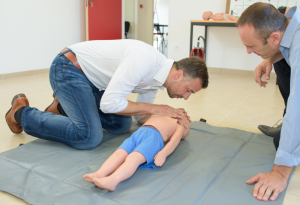 The Best Birth online Child CPR class provides hands-on CPR and airway obstruction practice for children 1-8 years old. Perfect for parents, grandparents, and babysitters. When the time came to have our baby, my wife and I had to make a lot of decisions under pressure. Sarah’s help was invaluable; she had us simulate different scenarios before the birth which helped potentially confusing and overwhelming situations seem familiar. The techniques used in her programs reminded me of the ways my Olympic coaches used to prepare us for the big event.